In the midst of the SNC-Lavalin affair, Prime Minister Justin Trudeau was greeted by friendly faces in Winnipeg at a Liberal donor's event at The Forks Monday night. The gathering was part of an overnight stop in the city. "What a pleasure to look towards this year isn't it?" said Trudeau. 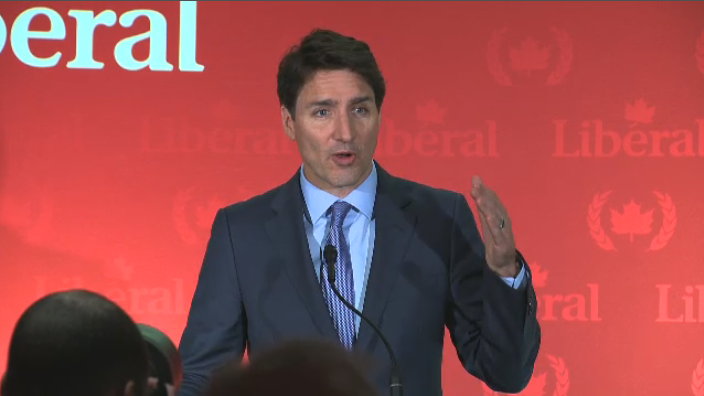 In a campaign-style speech, Trudeau began by attacking a former political foe, Stephen Harper. "You'll remember for ten years we had a Conservative government under Stephen Harper that didn't quite understand how to run an economy," said Trudeau. The Prime Minister also turned his attention to the current Conservative Party leader Andrew Scheer, warning the room about populism around the world. "The politics of micro-targeting to certain communities and letting others aside and Canadians might have a choice to go with that if they want to go with Andrew Scheer," said Trudeau. With a room full of Liberal Members of Parliament, former MPs and supporters, the PM touted his government's record to date on unemployment, infrastructure, and reconciliation efforts. But Trudeau made no specific mention of the SNC-Lavalin file. Instead he used the speech to rally the crowd as the fall election looms. "All of you need to step up, we need all of you to keep up your efforts," he said. While the reception inside was warm, outside a small rally of workers and union officials protested over the ongoing issues with the Phoenix pay system. "We're out here to actually let the Prime Minister see the faces of the employees that are not getting paid," said Marianne Hladun with the Public Service Alliance of Canada. Trudeau did not take questions from the media but was expected to at a Tuesday morning announcement on skills and training.